You need a general contractor license in North Carolina if you want to bid, construct, superintend or manage the construction of buildings, highways, public utilities and other types of projects over $30,000. To get licensed, you must apply to the North Carolina Licensing Board for General Contractors (NCLBGC). This process includes completing a license application form, passing an exam, providing documents like financial statements, and obtaining a North Carolina contractor license bond. 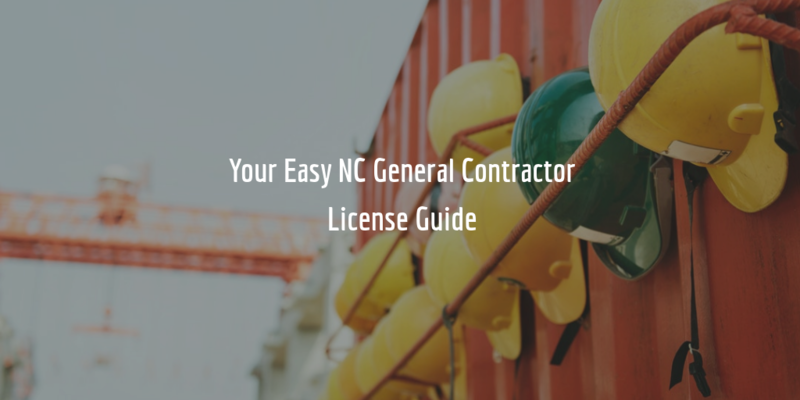 Keep reading for a full breakdown of the licensing process for the general contractors in NC. General contractor licenses issued by the NCLBGC have a classification and a limitation. The license classification is the specific type of work that can be performed with the license, whereas the limitation concerns the maximum dollar amount of the projects for which the license is valid. You can view a detailed description of each classification in Title 21, Chapter 12, Section .0200 of the North Carolina Administrative Code. More than one classification can be obtained with one application. To get any of these classifications for your license, a qualifying exam needs to be passed. When an exam is passed by someone on behalf of a license, that person is considered a qualifier. Qualifiers are managing employees, officers, or other personnel in your company who have passed exams. The licensee is the entity (company) that applies for the license, whereas the qualifier is the person that passes the exam. Qualifiers are not license holders and one license can have many qualifiers unless the license application is individual. In the latter case that individual will be both the license holder and qualifier. If a license has only one qualifier, and that person leaves, a new qualifier must be found for the license within 90 days so it doesn’t expire. Each of these limitations requires that contractors come up with a certain amount of working capital OR a certain amount of net worth OR obtain a surety bond in a particular amount. See the bonding section below for full details on the financial guarantee requirements! To get licensed as a general contractor, you need to comply with the requirements below. To be able to apply at the NCLBGC for a license, you will need to be allowed to conduct business in North Carolina. Registrations are issued by the NC Secretary of State. Once you complete your application, you need to submit it to the Board. The Board will review it within 2-3 weeks and determine if it meets all necessary requirements or requires corrections. If your application meets all criteria, you will be mailed an exam eligibility letter, unless you have an exam waiver. You will then need to schedule one or several exams with an exam vendor. After you pass your exam(s) successfully, the Board will be notified by the exam vendor. It will then review your application once more, typically within about two weeks, and issue your license. Licenses are renewed yearly on January 1. The renewal period begins in October. Any licenses not renewed within 60 days of expiring go invalid. There is a $10 monthly penalty fee for any license renewal that has been filed on or after January 1. What are the bond amounts for North Carolina general contractors? To get bonded, you must pay a surety bond premium. Your premium is equal to a percentage of the total amount of your bond. When you apply for a bond, the surety will provide you with a rate on your bond based on your personal credit score. Given the high amount of these bonds, it is likely that the surety will also request to review your personal and business financials and other information. The higher your credit score is, the lower your bond cost will be. Applicants with a credit score of 700 FICO or more typically get the lowest possible rates on their bonds. Such applicants can sometimes get licensed for as little as 1% of their bond amount. Why do contractors need a bond? The contractors license bond is a central requirement for contractors in North Carolina. The bond guarantees contractors’ compliance with the North Carolina Administrative Code. In particular, according to the Code, the bond is for the benefit of anyone who is damaged by a contractor due to a breach of a construction contract or a contract for the furnishing of labor, materials or services. The bond also protects against damages due to unlawful acts or omissions in the performance of a contract. Complete our bond application form and we will shortly contact you with a free and exact quote on your contractor license bond.